Training Camp Question #3: Will The Bills Defense Be Elite? For the next 8 days, leading up to the start of Bills Training Camp, Buffalo Sports Page will ask and answer the ten biggest questions facing the team in 2018. The first thing we need to do is define elite when it comes to a defense. Let’s define elite to the top quarter of the league. This means…can the Bills have a top eight defense in football?This would be a huge upgrade from last year. The Bills ranked 18th in points and 26th in yards last year. On the upside, the Bills were one of the better teams when it came to turnovers. On the year Buffalo was +9 in turnover ratio and their 18 interceptions were one of the most in the league. Let’s start by stopping the run better. Last year the Bills gave up 124 yards per game on the ground. That ranked them 29th in the league. Star Lotulelei was brought in as one of the Bills top free agent signings. Sean McDermott knows what Star brings to the table. He is an unselfish player that will take on the double team and allow other players to shine. Luke Keuchly was a better player in Carolina because of Star Loutulelei. This will be a huge upgrade from last year when the Bills traded Marcell Dareus and got little from that position all year. Harrison Phillips is a huge versatile player on the inside that should help the Bills rotation. Phillips will see the field a ton. He can replace Lotulelei or aging Kyle Williams on the inside. I dedicated a whole article to the Bills pass rush, but suffice to say if the Bills defense is going to be elite, the pass rush needs to improve. The 27 sacks the Bills had last year ranked them 29th in the league. Trent Murphy was brought in this year in free agency. Murphy needs to return to his form of two years ago when he had nine sacks for Washington. Jerry Hughes will be helped from Murphy being opposite of him. Hopefully Hughes can regain his form of bringing consistent pressure on the QB. Shaq Lawson is the big question. He transformed his body but training camp will tell whether he will be a better pass rusher. The Bills certainly could use the former first round pick to drop the bust label. In order to become elite the Bills are going to need to bring that sack total up about 15 to the 40-42 range. Pittsburgh, Carolina and Jacksonville were the only three teams over 50 last year in terms of sacks. Fifty is an unrealistic number but 40 sacks should be on the table. Much is riding on Tremaine Edmunds to step right in and lead the defense. All reports coming out of OTA’s is that he’s a freak. His wingspan is off the charts. The Bills needed to get more athletic in the middle of the field. Edmunds should be an upgrade from Preston Brown. Brown was a good player, so how much of an upgrade could decide if the Bills defense is better or becomes elite. I would argue that the way the Bills secondary played last year they were elite as a unit. Tre’Davious White came in as a first round pick and was better than I could have imagined. According to Pro Football Focus, White was the second best cornerback in the NFL last year. Opposing QB’s had a 68.2 rating when going after the 23 year old rookie. That’s elite. Micah Hyde was ranked 62nd on the NFL Network’s best players in the NFL. He was one of the few Bills on the list. His ability to lead the secondary and put them in the proper position was a noticeable difference from the Rex Ryan defenses of the two years previous. Hyde finished the year with five interceptions. More importantly, he and Jordan Poyer were graded as one of the top safety duos in the NFL last year. They were elite. Vontae Davis comes to the Bills off of an injury-plagued season with Indianapolis. In 2014 and 2015 he was one of the best corners in the game. The Bills don’t need him to be that good to be elite. However they do need him to stay healthy, be on the field and somewhat return to a better form than he displayed before he was injured last year. There’s no question in everyone’s mind that the Bills defense will be better this year than last. The additions of Trent Murphy, Star Lotulelei, Tremaine Edmunds, Harrison Phillips and Vontae Davis almost make it hard to believe they will be worse. 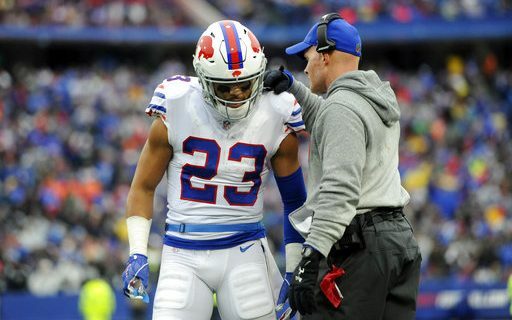 The second year under Sean McDermott’s defense should bring an improvement just because of familiarity. The question is how much better? Do they improve to middle of the pack or can they become a top eight defense and become an elite NFL defense?